Think you’ve run out of room in your bedroom? You might just need to look at the space in a different way. Cast your eye around the room and put any neglected areas to good use with these clever design ideas. Don’t write off a low area beneath the eaves. 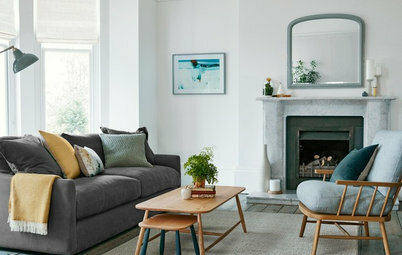 Instead, locate a seat in the space to create a cosy, relaxing spot. Here, a pretty armchair is perfectly positioned in an otherwise unused corner. The little artwork next to it helps to create a vignette and makes the area a real feature in the room. Want to free up some floor space? 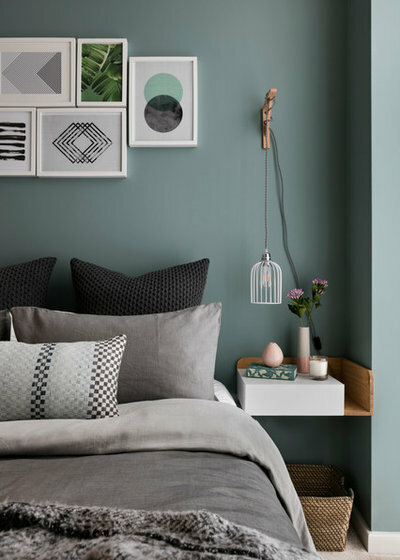 Ditch the bedside table and opt for a shelf instead. This one sits nicely flush with the corner wall and provides just enough room for pre-sleep essentials. The honey-coloured wood looks particularly beautiful against the blue walls, too. If this doesn’t offer quite enough room, the extra space below is the perfect spot for a storage basket. Unusual-shaped windows sometimes present a design dilemma. 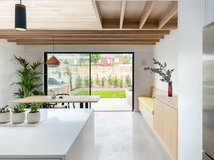 However, a cleverly placed sideboard has turned this wide, rectangular opening into a feature. The sideboard’s shape replicates that of the window frame and highlights its unique appearance. 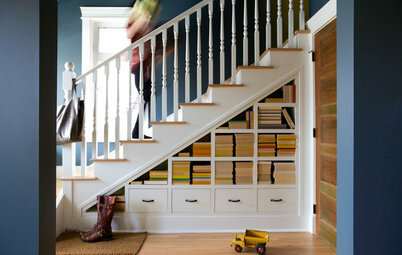 It not only looks lovely, it provides nifty storage, too. 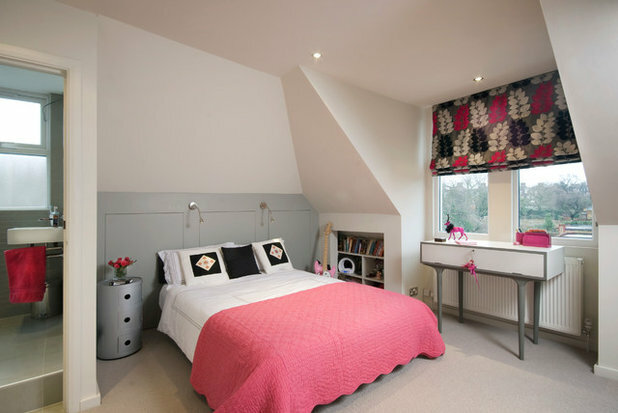 Place your bed against an unused chimney breast and employ the adjacent alcoves for bedside storage. Here, three neat shelves provide extra surfaces above two modern bedside units. 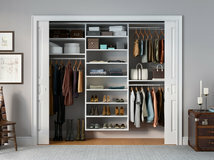 The design has created a lot of storage and frees up space for a wardrobe elsewhere in the room. 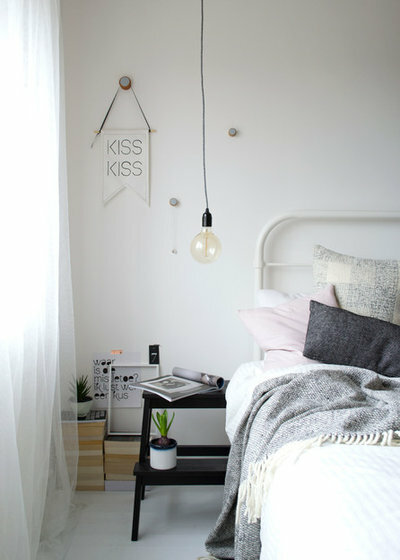 Why waste valuable space on your bedside table when you could hang your lamps instead? 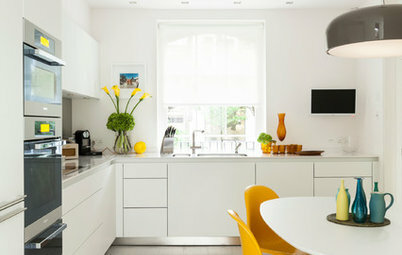 There are some gorgeous designs for subtle, low-slung pendants around, so it should be easy to find something you like. The oversized bulb here is simple yet striking and gives the whole space a cool, contemporary feel. 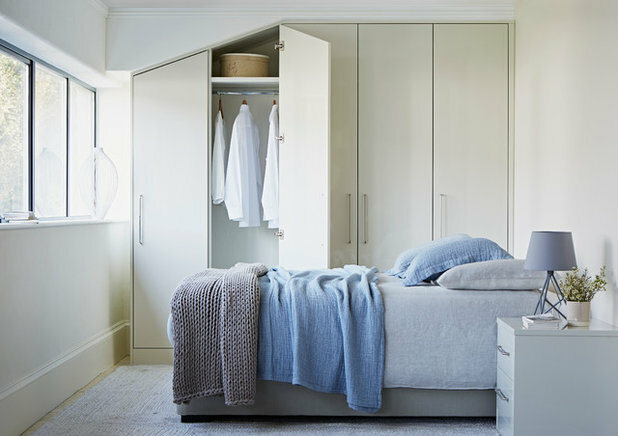 This built-in wardrobe has maximised every inch of available space in this bedroom. 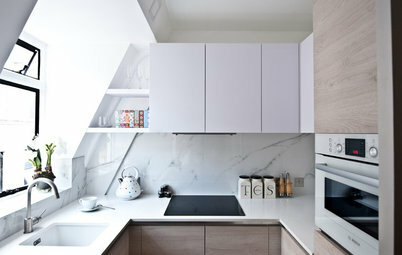 Instead of looking at the sloping ceiling as a hindrance, the joiner has integrated it into the design of the cabinets. The wardrobe is now a statement feature in the room. 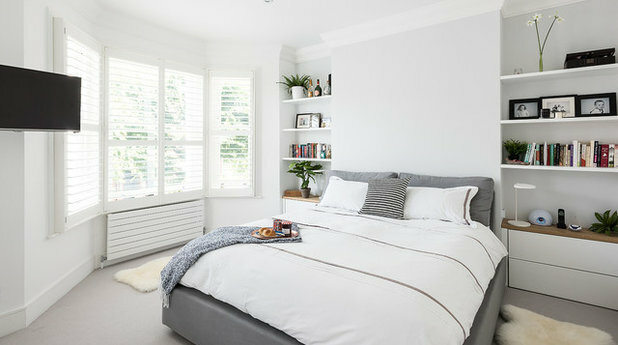 If you think you’ve run out of space in your bedroom, consider moving your bed out slightly and using the space behind. Here, a simple false wall has been built behind the bed to add some neat, extra storage to the room. The recessed shelf is a quirky version of the standard bedside table, while the wall-to-wall shelf above provides plenty more surface area. 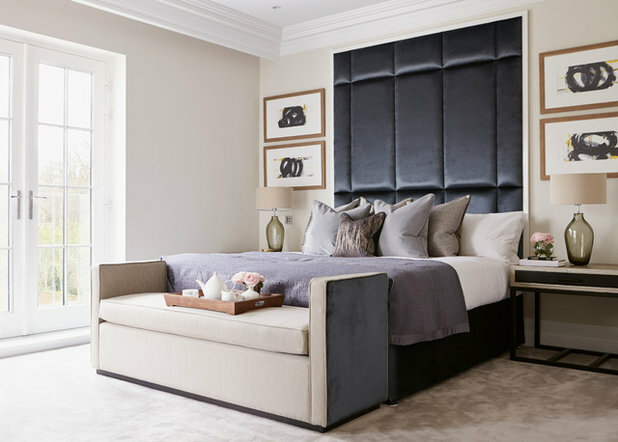 A classic yet effective way to maximise space in the bedroom is to place a seat at the foot of the bed. 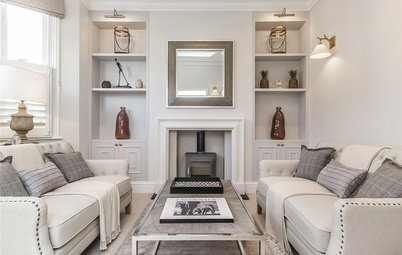 A sofa or ottoman gives the room a luxurious feel and can also double up as storage. This clean, modern ottoman provides a comfy place to sit, as well as an extra surface. 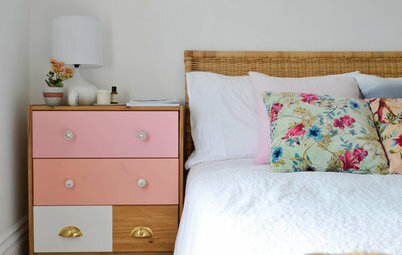 Lift up the lid and you have a great space in which to stash your bed linen, too. 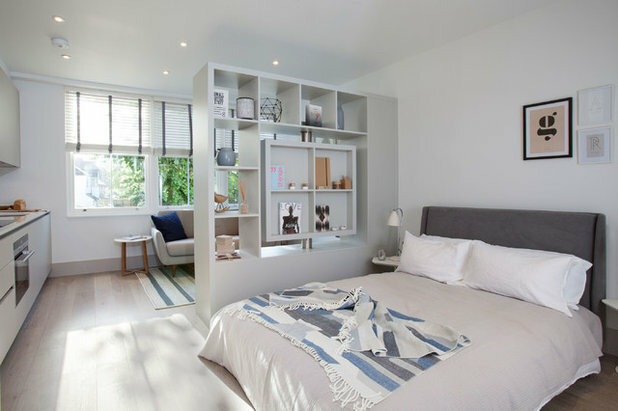 If you’re lucky enough to have a large bedroom, maximise its potential with a room divider. This one may be part of a large room, but that room must work hard as kitchen, living area and sleep space, so this useful shelving unit not only does its job as a divider, but also doubles up as a storage space. 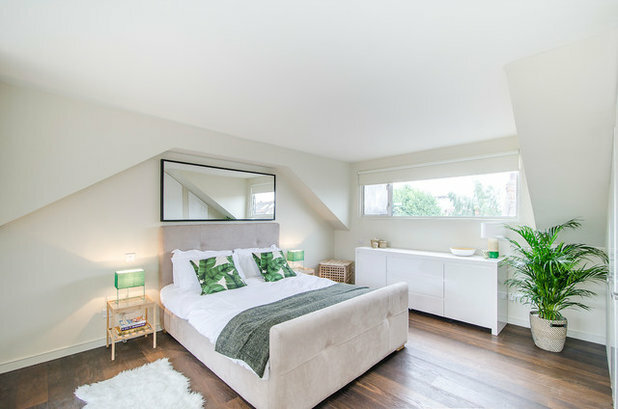 In a large bedroom that doesn’t need to multi-task, you could create the sense of a suite by having a seating area like this, or alternatively make use of the space by turning it into a walk-in wardrobe. 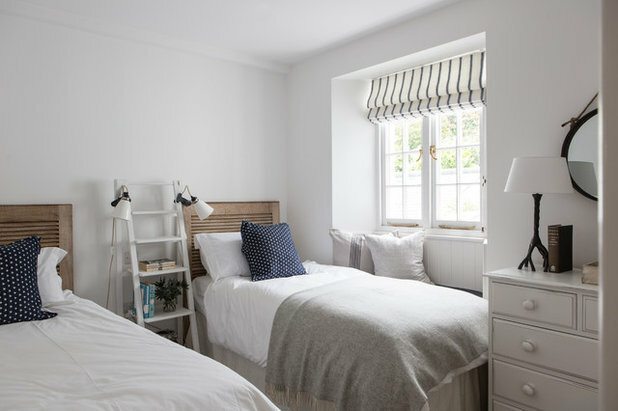 In this small twin bedroom, a bookshelf ladder has been placed between the two beds. 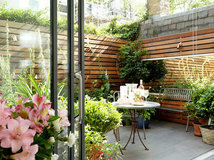 By choosing something with height, the owners have made the most of vertical space. Multiple ledges provide plenty of surface space, and the clip-on lamps are perfectly positioned for bedtime reading. This recessed bookshelf is a fabulous use of an awkward corner. 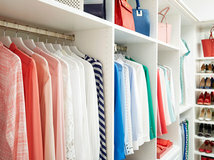 By cutting into the wall, the space has been transformed into a neat, streamlined storage solution. 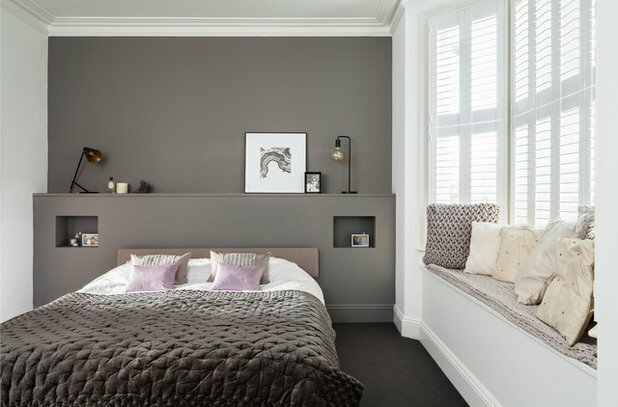 A good joiner will be able to advise you on how to utilise wall space like this in your own bedroom. Window seats are lovely places to sit and watch the world go by. 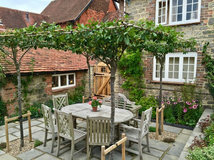 They’re often located beneath a large bay window, but they can work just as well under a small opening, too. 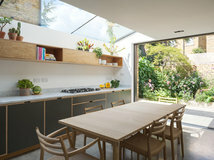 This one makes brilliant use of a little alcove window and provides an ideal perching place for taking in the gorgeous view. 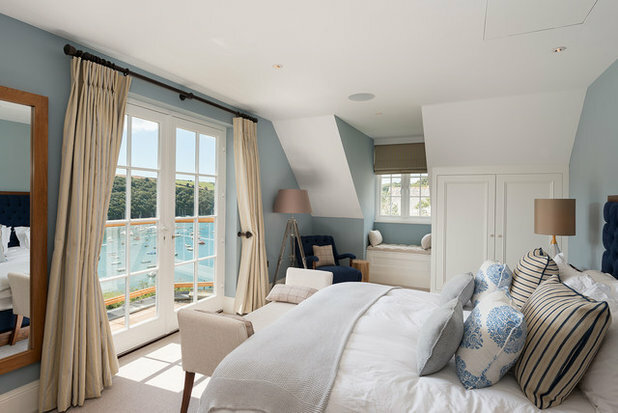 What do you think of these ideas to use wasted space in the bedroom? Share your thoughts in the Comments below. Wasted space? Bedroom? I wish! 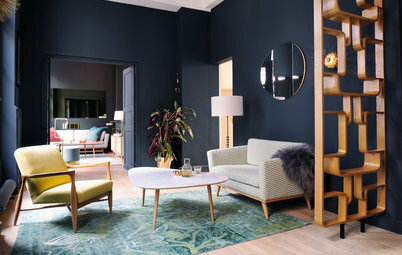 Some lovely rooms and great tips! We've even spied a set of our Relaxed Denim Graphite Grey in their too. Small Space Living Think You Haven’t Got Space for a… Boot Room?